The damp, white air sang with the croaking voices of cicadas. There were other sounds too – crickets, different kinds of birds – but the cicada chorus was so loud it drowned out almost everything. I love this sound. I asked you how to say “cicada” in Chinese, and you told me, but then, as always, I forgot. Life is a constant struggle between memory and foreign vocabulary. We were so high up that we could look down and see clouds. The steep valley walls were dark and thick with pine trees and the higher peaks were veiled in ghostly mist: ornate silhouettes of temple roofs shyly peering out. This could have been a thousand years ago, or the opening scene of a kung fu movie, or both. It was the China of the imagination, but in real life. Finally. We’d travelled to the mountains on a tour bus because it was the cheapest and easiest way to get there. So of course it was packed with tourists of the most obnoxious variety – shouting and screaming, playing music on crackly phone speakers, children running everywhere. And of course I was the only foreigner. Since we’d boarded the bus at 6am you had been constantly harassed with the same three questions: “Which country is she from?” “Is she your girlfriend?” “Does she know Chinese?” I had understood perfectly and answered each question myself. The tourists had almost passed out with shock, and you had laughed. But the novelty had worn off pretty quickly. These were the people who followed the leader. The leader with a flag and a microphone, who told people what was interesting and what to take photos of. Sheep, I told you. “Baaa,” you said. Everyone got off the bus and followed the flag to the first temple. The flag shouted into the microphone. The sheep took out their cameras. “Come on,” you said. You ran up some steps behind the temple and I followed. You were you, and you weren’t holding a flag. We climbed endless steps, passed temple after temple. We looked into a few of them – smiling gods draped in yellow and red, candles flickering, air filled with incense. A priest came out and tried to hand me some sticks to light, but you told him no. You weren’t interested in all that, and he’d probably ask me for money after. I didn’t tell you that I’d lit incense in Japan and Taiwan, that in India I’d folded my hands in front of Shiva, Durga, Hanuman. 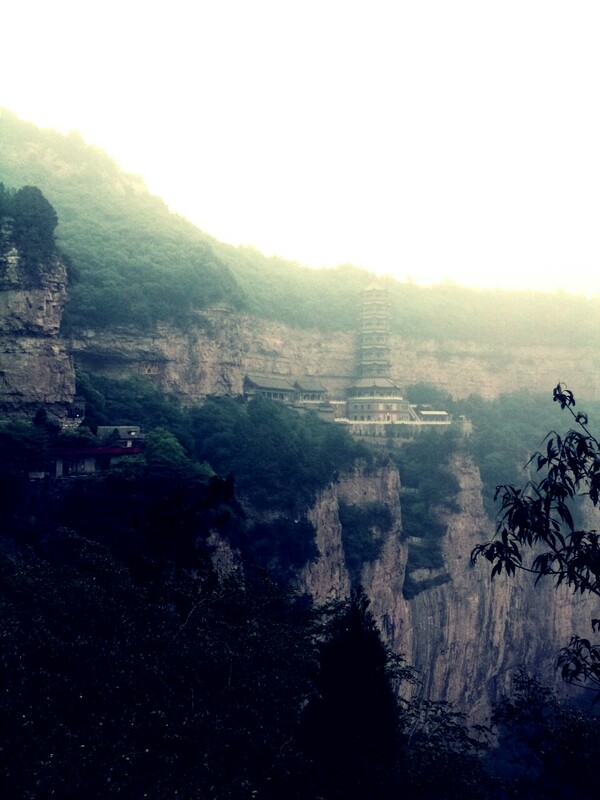 Below us we could see our tour group gathered round a souvenir stall, buying fake jade Buddhas and straw cowboy hats. Chinese pop music thump-thumped from a van selling Coke and crisps. An old man tried to coax families into having their photo taken with a life-size plastic panda. Then the flag shouted and the sheep followed. Baaa. We let them go, and continued upwards. A narrow path skirted the mountain and turned into a precarious zigzag of concrete steps going up and up and up. It looked like a lot of hard work, but there were no tourists to be seen. “Let’s go,” I said. Up, up, up. We stopped at a small, locked temple at the top of the concrete steps and sat down to share a can of iced coffee, complaining that it had too much sugar and milk. Sitting there, I remembered that in my bag I had a padlock. Small and lime green, bought from a one hundred Yen shop in Japan in January to lock my broken suitcase, used again in China for my clothes locker when I’d briefly – and stupidly – joined the gym. I found a small hook in the wall and attached the lock. You took a picture to document it and said we could come back sometime in the future and find it again. Beyond the temple a cracked, cobbled path gently wound further up the mountain, and the bare cliffs gave way to shrubs and oak trees. Cicadas croaked. Dragonflies darted between shadows. The tranquility became borderline ridiculous. The path continued to wind uphill through the trees and we deliberated whether to continue or go back. I touched a mosquito bite on your cheek. On the ground hundreds of ants were swarming out of a tiny hole, and you said it was because they knew it was going to rain. And then the path grew wider and we passed a couple of old wooden buildings with cracked, peeling paint. An old man in grey robes came out of one of them and nodded to us. We continued, walking through a long corridor with Chinese characters carved along the right-hand wall, and coming out in front of an ancient, towering building. The Temple of Completeness. Balanced right there on the side of the mountain, nine storeys high. The priest reached into his robes, took out a key and unlocked the temple’s heavy double doors. A cloud of dust swirled out, and for a few moments the dark entranceway danced with tiny, glittering particles. We followed the priest inside. It was cool and damp and smelled like furniture polish. As the dust began to settle and my eyes adjusted to the dim light, I suddenly realised I knew the god sitting there in the middle of the room. Bright gold with pink lips in a gentle smile, she sat as she always did, cross-legged on a giant lotus flower. The priest nodded and smiled, wrinkles deepening on his sun-weathered face. We followed him out of the main hall and watched as he pushed an old table out of the way to reveal a wooden set of steps, so steep they were more like a ladder. He pointed upwards, telling us we could climb the tower. Each rung of the ladder was coated in thick dust and I wondered who’d been the last person to climb up here. We ascended slowly, carefully, until we climbed through a trapdoor onto the next floor. Another room with another god, and the smell of incense and dust and damp walls. You went to the next ladder and began to climb, telling me to be careful as I followed. I went slowly, breathing in the dust and darkness. As we continued, floor after floor, we got quicker and more confident with the climbing. I asked you which floor we were on. You said the sixth. I thought the seventh. I thought about what we’d see at the top. Then I thought about our tour group, far below us. Were they still following the authoritarian flag, taking photos as instructed? Were they wearing their straw cowboy hats? Were they happy? Maybe they thought we were the crazy ones, abandoning ship and venturing into the wild by ourselves. We kept going. Up, up, up. Dust on my clothes and hands smelling of old wood and varnish, I pulled myself through the final trapdoor. “This is the top,” you said. The ninth floor. The ceiling was painted gold and blue. And there, in front of us, was Buddha, bright gold, waiting patiently. His lowered eyes were focused on something beyond me and you – beyond everything – and his half-smile was serene like the walk through the oak trees. Nothing was here on the top floor: only stillness. And the distant croaking of cicadas. You stood in front of the Buddha for a second, then knelt on the dusty floor. And you bowed. Slowly. Three times. I smiled at you. “Sometimes I believe,” you said. We went onto the balcony and looked down into the valley. Far down there, below the path and the cliffs and the road, below the buses, the tour groups, the souvenir shops and the thumping C-Pop, the clouds and pine trees had turned a greenish blue. It was raining. From high up in the deserted, dusty land of gods we looked down in silence and watched the rain.